Black Friday camera deal: Canon EOS 4000D DSLR starter kit for just £249! Another great Black Friday camera deal from Amazon UK that we have just spotted... and the perfect xmas present for the person in your family who wants to get into photography, or needs a 'proper' camera for college. 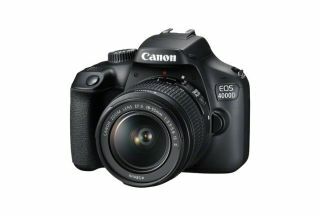 The Canon EOS 4000D is the latest cheap DSLR camera baby in the Canon family… but what makes this deal so good is that you don't just get the camera body and the basic kit lens, but you also get a camera bag and a memory card thrown in for the sweet price of £249. The lens is Canon's own EF-S 18-55 mm f/3.5-5.6 III, and bag is a Canon ES100 black shoulder bag which we have seen on sale elsewhere for £39.99. The memory card you get with this kit is the SanDisk 64GB Ultra SDXC which is a tenner's worth of extra value... and something you obviously need in order to start taking pictures!